Christmas has come early for blackjack fans at All Slots Casino, where the doors to the Christmas Market have been opened and all kinds of incredible bonus offers await. If you’re looking for a safe online venue to play real money blackjack this December, make it All Slots, and take advantage of these fun-filled festive offers. How does the blackjack Christmas Market work? All Slots Casino offers a great loyalty program, where registered players are rewarded for every real money bet they place on the site. This means every time you place a $20 wager on a blackjack game at All Slots, you’ll receive one loyalty point (excluding Classic Blackjack, which requires a $500 bet for every one point given its low house edge). Log in to All Slots Casino and head to the Christmas Market link through the promotions page. Your Christmas Coin balance will appear at the top of the market page and is based on how many loyalty points you have accumulated. Scroll through the different Christmas Market stalls on offer and click to purchase any of these bonuses. 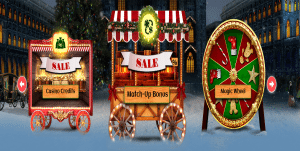 Magic Wheel – Spin the wheel to win festive prizes such as further discount on Christmas Market items, extra Christmas Coins or loyalty point multipliers. Free Spins – Buy free spins on selected pokies at heavily discounted prices. Casino Credits – Turn your loyalty points into Christmas credits. Match Up Bonus – Have the casino match the amount of your next real money deposit up to a specified amount. 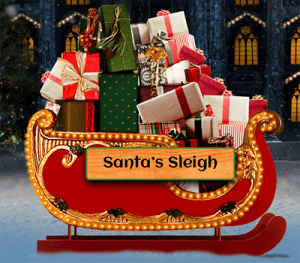 Santa’s Sleigh – Come back on Christmas Day to find the special present that Santa has left for you. This promo is running throughout the silly season, ending on January 1st 2017. Choose your bonuses wisely and you could be entering the New Year on a high note. If you don’t want to use your loyalty points on the Christmas Market, you can keep playing blackjack at All Slots to earn more points, which can then be used to move up through different loyalty tiers. The higher you climb through the loyalty program, the better your rewards become. Blackjack games at All Slots are available in instant-play mode directly over your Web browser, or by downloading the premium casino software if you’re using a PC. Loyalty points are earned when playing on any platform, including at the All Slots mobile site. Head to All Slots Casino to play real money blackjack this December and reap the rewards waiting in the Christmas Market. If you’re new to All Slots, sign up via our page to claim an exclusive welcome bonus that includes up to $1600 in matched deposit welcome bonuses.